This week is shaping up to be rather climactic. Literally every element of our lives will in some form or fashion change this week. Items ranging from buying a new stove to traveling to Chile will be discussed, mulled over and otherwise confirmed or denied. Several meetings are booked (one has already taken place) and preparations made. Charts have been drafted, lists conceived and subconsciouses tapped. I have very real conversations with myself sometimes about my ability to make change in my life. It feels dangerous. Like a super power. Truly, it is invigorating; until weeks like this come to pass, where somehow every initiative pinnacles at the same time and the overload of opportunity starts to feel overwhelming. Fear not though, we are still the dictators of our own destiny, despite the chaos. Much of this week’s calamity I cannot yet share publicly, though I can confirm it includes buying a new stove/oven for the kitchen, deciding whether or not I will visit Chile in March and photographing Michael Ignatieff on Thursday. I tore through some photos last night and now am caught up through November. I uploaded pictures to my online photo gallery from Ottawa and Whistler for your viewing pleasure. Up next: Las Vegas. Cheers, and for what it’s worth, happy Monday. A new stove?? How exciting….what happened to the old one? Btw, great photo, i love the lighting and the perspective. Where is it from? Yes, very exciting. Home ownership is often so. Thanks for the comment Moj. This is in Ottawa, outside the Art Gallery of Canada. 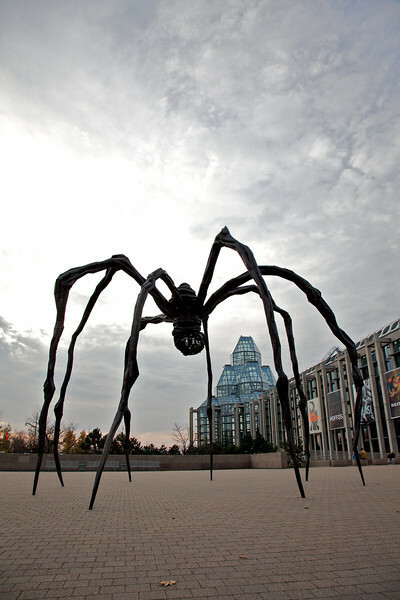 The spider is an art installation by Louise Bourgeois – I think the Gallery spent $2 million on this piece. I like this artist quite a bit.